If you need a small to medium friction device for your lowering applications Buckingham's Port-A-Wrap is preferred by most arborists. 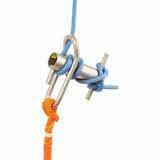 This device is more user friendly, designed to make attachment of rigging line easier. Secure rope retention bar eliminates loss of wrap. This version boosts stronger, more durable construction than it's predecessors. The large device will take a 3/4" line. This device is supplied with the most durable nickel plating. Working Load Limit: 2000 lbs.